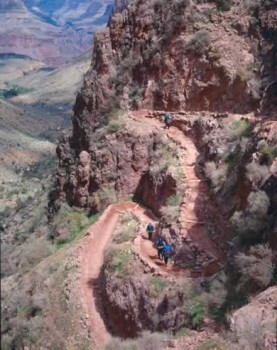 Hikers on Bright Angel Trail, Grand Canyon National Park. Photo credit: National Park Service. Headed to the Grand Canyon? 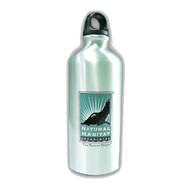 Your Nat Hab steel water bottle will come in handy! We’ve been providing reusable bottles to our guests for more than a decade, and it’s a trend that’s catching on in our national parks,too. Grand Canyon National Park is moving ahead with a ban on the sale of individual disposable plastic water bottles, effective March 10. Initial plans approved last year were delayed in the wake of a challenge by parks donor Coca-Cola, which distributes bottled water under the Dasani brand. Coca-Cola has donated more than $13 million to the parks through the National Parks Foundation. After National Park Service Director Jon Jarvis initially blocked the ban, provoking public outcry, an NPS directive issued in December 2011 grants permission to park directors to ban the sale of disposable water bottles, as long as a regional director approves the move following a “rigorous impact analysis” that includes factors such as cost to concessionaires, signage directing visitors to water bottle filling stations, and the health implications for visitors who might opt to drink from surface water sources that could expose them to disease. The policy shift is part of a larger Green Parks Plan expected to be announced soon. The plan, which seeks to reduce waste in the parks, has a goal of offering water bottle refilling stations in at least 75 percent of park visitor centers by 2016, the year the agency marks its centennial, according to National Parks Traveler. 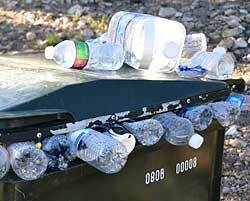 Plastic bottles account for 20% of Grand Canyon National Park’s waste stream, and most of the litter below the rim. Photo credit: National Park Service. Discarded plastic bottles account for 20 percent of Grand Canyon’s waste stream and 30 percent of its recyclables, according to the park service, and plastic bottles are “the single biggest source of trash” found inside the canyon, the park’s head official told the New York Times. 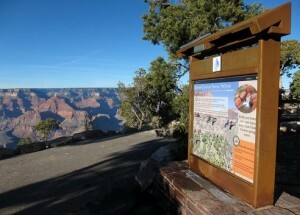 Grand Canyon follows Zion and Hawaii Volcanoes national parks in implementing the ban. Zion instituted a similar program in 2008 and received a park service environmental achievement award in 2009 for eliminating 60,000 plastic bottles from the park in its first year. At Hawaii Volcanoes, the cooperating association estimated it will gross $80,000 a year in reusable bottle sales and will net a profit, according to National Parks Traveler. In anticipation of the ban, Grand Canyon has installed 10 free water supply stations on the South Rim and three on the North Rim. Fresh spring water will be sourced from the park’s approved water supply at Roaring Springs. In addition to the park filling stations, three park concessionaires — Delaware North, Forevever Resorts and Xanterra — have either provided new filling stations or refitted existing water fountains at most of their facilities, notes USA Today Travel. A variety of reusable, souvenir water bottles are available for purchase at all of the park’s major retail outlets, for as low as $1.99. The new direction taken by the National Park Service is in line with a trend in which travelers are switching back to reusable water bottles, as USA Today travel reporter Laura Bly details. Her story highlights the new post-security “hydration stations” at San Francisco International Airport’s newly renovated Terminal 2, and efforts in Italy’s popular Cinque Terre to prompt travelers to buy a 1-euro metal flask and refill it from new water fountains along the trail that connects the five seaside villages. An annual influx of 3 million visitors has deluged the region in plastic; in the month of August alone, some 400,000 plastic bottles were discarded along the World Heritage coast south of Genoa. 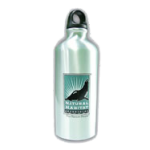 So, when you come to gape into the multicolored depths of the Grand Canyon or marvel at Zion’s towering cliffs on Nat Hab’s Canyons of the Southwest adventure, be assured that we’ll have a water bottle ready and waiting for you, just as we’ve done for years. But then, being in the vanguard of greener travel is what we’ve always been about!